Department of Economic Development, Jobs, Transport, and Resources (former) Department of Primary Industries (2006). Anderson Inlet Fisheries Reserve Management Plan - 2006. Fisheries Victoria Management Report Series No. 28. The purpose of the Anderson Inlet Fisheries Reserve Management Plan (AIFRMP) is to specify the objectives, strategies and performance measures for managing fishing activities within the Anderson Inlet Fisheries Reserve. The AIFRMP has been prepared under the requirements of the Victorian Fisheries Act 1995 and has been developed in accordance with gazetted Ministerial guidelines. The AIFRMP prescribes fishery management arrangements for the Anderson Inlet Fisheries Reserve in accordance with a nationally agreed framework for applying the principles of Ecologically Sustainable Development to fisheries. processes for participating in management of other relevant values/uses in and around the inlet, to ensure that any possible concerns regarding consequences for recreational fishing can be raised and considered. In view of the lack of information on recreational fishing and key fish habitats in the inlet, most existing fishery management arrangements will initially remain unchanged while the focus is on establishing programs to characterise the recreational fishery; monitor fishery trends and the status of key target species; and identify key fish habitats in the inlet. If information from these programs indicates a need to alter fishery management arrangements in the future, to ensure sustainable use or to meet changing demands for recreational fishing opportunities, then changes will be considered in consultation with stakeholders. Indicative costs and priorities for implementation of the AIFRMP are provided. Annual progress reports and a 10-year review process will allow fishery management arrangements for the Anderson Inlet Fisheries Reserve to be adapted to changing future circumstances, ensuring sustainable use of fisheries resources with maximum economic and social benefits to the community. A Reference Group will be established to work with the department to deliver the key management outcomes from the AIFRMP. enable the development of a management plan for the reserve, which includes specified controls on access, activities and equipment, and a strategy for ensuring compliance with these controls. The Anderson Inlet Fisheries Reserve Management Plan (AIFRMP) specifies the objectives, strategies and performance measures for managing fishing activities within the Anderson Inlet Fisheries Reserve, and was developed in consultation with recreational fishers and other interested sectors of the community. The AIFRMP formalises fishery management arrangements for the next 10 years in accordance with the principles of Ecologically Sustainable Development (Fletcher et al., 2002). The AIFRMP also describes other uses, activities and environmental processes in and around Anderson Inlet that may influence fishing opportunities or the productivity of fish habitats in the inlet. The AIFRMP identifies agency responsibilities and processes for management of these non-fishing uses/activities, and actions needed to ensure that any possible concerns regarding consequences for fishing or fish habitat can be raised and considered in the appropriate forums. Anderson Inlet (Figure 1) is a small (about 20 km²) estuarine lagoon at the mouth of the Tarwin River. It is located near Inverloch, about 140 km south - east of Melbourne, and has a catchment area of about 1,600 km². Anderson Inlet is a shallow estuary, with about 85% of the area consisting of intertidal mud or sand flats (both bare and vegetated), and the remaining 15% consisting of channels and islands. Apart from the Tarwin River, other smaller streams flowing into Anderson Inlet include Screw Creek, just to the east of Inverloch, and Pound Creek and Cherry Tree Creek, further east along the northern shore of the inlet. Harrison et al., (1990) produced a Resource Directory to aid in the management of various uses of natural resources in and around Anderson Inlet. This document is the only known compilation of detailed information on the physical environment, flora and fauna, and human uses of the inlet and surrounds. The climate of Anderson Inlet is typical of coastal areas of south-east Victoria, with generally warm to hot and dry summers and cold, wet winters. Mean annual rainfall is about 920mm at the inlet and more than 1000mm in some parts of the catchment, with twice as much rain falling in winter months as in summer months (Harrison et al., 1990). Subtidal water temperatures in the inlet display substantial seasonal variation (summer maximum about 22°C; winter minimum about 11°C). Intertidal waters are slightly cooler than subtidal waters in summer because of evaporation, and slightly warmer in winter because of solar heating. Temperatures in the upper estuary at the mouth of the Tarwin River are slightly warmer than at the mouth of the inlet near Inverloch in winter, and significantly warmer in summer. The lower end of the inlet is dominated by sandy substrate, mainly of marine origin. There is substantial movement of these sands, driven mainly by shoreline erosion due to wave action - particularly around Point Smythe - and by tidal water currents. The upper end of the inlet and the lower reaches of inflowing waterways are dominated by fine sediments deposited from the catchment. The Tarwin River catchment has been extensively modified for agricultural uses - mainly dairying and grazing of cattle and sheep. Substantial clearing of indigenous vegetation from the catchment (estimated loss of over 80% since European settlement), and agricultural land use practices, have contributed to increased erosion and sediment deposition and at least one eutrophication event which probably occurred in the top part of the estuary and lower part of the Tarwin River in December 1988 (Harrison et al., 1990; NREC, 1991). Construction of drainage canals and levee banks has also affected inundation of wetlands in some areas around the inlet. While the rivers and streams flow all year round, a large portion of the total sediment and nutrients deposited in the inlet occurs during floods or high flows resulting from heavy rainfall events. Anderson Inlet and surrounding areas attract up to 30,000 visitors a day in peak season, many of whom engage in water-based recreational pursuits. 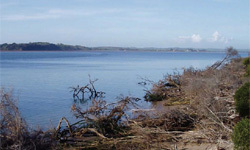 Parts of the foreshore of the inlet, particularly around Inverloch, are increasingly being affected by residential and tourism development (NREC, 1991). Focal points for development and recreational activities include the Inverloch area, Venus Bay Estates and Tarwin Lower. Whilst productive fish habitats such as seagrass beds remain in some areas of the inlet, introduced species such as the tussock grass, Spartina, have proliferated. Seagrass distribution in Anderson Inlet is very low with only 2% of the inlet being covered (Blake et al., 2000). Historical information indicates that the inlet floor was once more extensively covered by seagrass, and it has been suggested that invasion of intertidal areas by Spartina and natural succession events may be responsible for the decline (DCNR, 1994; Blake et al., 2000). Spartina was first introduced to the Anderson Inlet area in the 1940s and again in the early 1960s to aid in land reclamation, stabilise intertidal mudflats, increase grazing land at low tide and assist with the prevention of coastal erosion (Rash et al., 1996). The area of Anderson Inlet infested with Spartina had increased to about 64 ha by 1980, 100 ha by 1991, 240 ha by 1998 (DNRE, 1998) and to more than 300 ha at present. This species is thought to have the potential to colonise nearly all intertidal areas of the inlet. Spartina infestation is particularly severe adjacent to Venus Bay, leading to community concerns over narrowing and shallowing of channels leading to Fisherman's Jetty; possible adverse impacts of Spartina invasion on mangrove/saltmarsh communities; and possible denial of intertidal habitat to fish stocks. Given the highly variable physical and ecological processes described above, it is likely that prevailing habitat and environmental conditions are exerting a substantial influence on the distribution and abundance of key fish stocks in Anderson Inlet quite apart from any direct effects of fishing. Prior to the November 2002 State election, the Victorian Government indicated its commitment to improving recreational fishing opportunities by proposing the establishment of fisheries reserves in three Gippsland estuaries: - Anderson Inlet, Lake Tyers and Mallacoota Inlet. The proposals for Lake Tyers and Mallacoota Inlet included the removal of commercial fishing, other than fishing for eels and bait. Commercial fishing had already been removed from Anderson Inlet. Public submissions received between October and December 2002 indicated majority public support for these proposals. Consequently Anderson Inlet was gazetted as a fisheries reserve on 3 July 2003 (see Appendix 1), to be managed primarily for the purpose of maintaining or enhancing recreational fishing opportunities. Results of the recent National Recreational and Indigenous Fishing Survey (Henry and Lyle, 2003) indicate that approximately 550,000 Victorians or 13% of the State's population went recreational fishing in the 12 month period prior to May 2000. Approximately 43% of total Victorian recreational fishing events in 2000/01 occurred in bays, inlets and estuaries, including Anderson Inlet. Most of this effort would have been expended in the larger bays and estuaries such as Port Phillip Bay and the Gippsland Lakes. Nevertheless smaller estuaries such as Anderson Inlet are popular for local residents and increasing numbers of seasonal visitors from Melbourne and other provincial cities. The National Recreational and Indigenous Fishing Survey also found that Victorians spent approximately $400 million on goods and services associated with recreational fishing activities during 2000/01. This was equivalent to $721 per fisher per year - the highest per capita expenditure in Australia. Approximately two thirds of this expenditure occurred in the Melbourne metropolitan area, but it is nevertheless clear that recreational fishing can have a significant impact on local or regional economies. Most recreational fishing in Anderson Inlet is angling. Angling occurs year round in the inlet but the peak period is from October to April when weather conditions are most favourable and visitors have holiday time available (Harrison et al., 1990). Fishing is mainly from small powered boats launched from boat ramps at Inverloch, Maher's Landing, Lower Tarwin or Venus Bay (Fisherman's Jetty). Shore based fishing also occurs in some locations (eg. around Inverloch, Screw Creek, Tarwin Lower, Fisherman's Jetty and Point Smythe), but much of the inlet is inaccessible for this purpose. Hand spearing for flounder is also permitted in parts of the inlet. Angling club records, information provided from public consultation processes for this management plan, and other observational evidence indicates that in recent years the main target species for recreational fishers in Anderson Inlet have been estuary perch, Australian salmon, silver trevally and yellow-eye mullet. Media reports from 1992 to 1997 also recorded recreational catches containing King George whiting. A limited creel survey conducted in 1990 (Smith, 1991) indicated that flathead (probably several species but mainly sand flathead) was the biggest component of the daytime recreational catch in the inlet. Other species that are caught in the inlet or have been targeted more frequently in the past include black bream, luderick, elephant fish, gummy shark, garfish, snapper, tailor, ling, calamari squid, flounder, eels, sea pike and mulloway. The only survey information on recreational fishing specifically for Anderson Inlet comes from a survey of recreational users of the inlet in 1989 (Harrison et al., 1990), and from monthly daytime angler counts, on-site interviews and examination of angling club records over the period 1989 - 1991 (Smith, 1991). Apart from these surveys there has been no systematic monitoring of recreational fishing in Anderson Inlet, and thus there are no recent estimates of total recreational catch or effort. The 1989 survey of 293 recreational users of Anderson Inlet found that 55% of them visited the inlet to engage in recreational fishing, and that fishing was the third most popular recreational activity after beach walking and swimming. The angler survey produced an estimate of 19,500 daytime fishing trips or 97,500 angler hours applied to Anderson Inlet in 1990. The estimated mean catch rate of 0.66 fish per angler hour resulted in an estimated total retained recreational catch of about 64,000 fish with an estimated weight of more than 19 tonnes (Smith, 1991). The author of the survey report noted, however, that due to the limited sampling strategy used in the survey these estimates were not particularly reliable. The main components of the 1990 recreational catch were flathead, Australian salmon, silver trevally, yellow-eye mullet, King George whiting and estuary perch. For all these species the estimated recreational catch weight exceeded the reported commercial catch weight in the inlet for the same time period (see Table 1). The following descriptions of the biological and ecological characteristics of key target fish species in Anderson Inlet are derived from published literature. While some recreational fishers have extensive knowledge of the distribution and behaviour of key fish species in the inlet based on personal observations, there has been little or no scientific investigation of the distribution, population dynamics or ecological requirements of these fish species in Anderson Inlet. As the name implies, estuary perch are resident in estuaries of south-eastern Australia from northern NSW through Victoria and Tasmania to the mouth of the Murray River in South Australia (Williams, 1970). Examination of fish caught in netting surveys of Victorian estuaries (McCarraher and McKenzie, 1986) indicated that estuary perch spawn during winter and spring months. Spawning is usually earlier in the season in Gippsland estuaries, and progressively later in estuaries to the west. Perch in spawning condition were most often found in waters with salinities between 10 and 24 parts per thousand and over seagrass or algal beds or rock reefs. The Victorian netting surveys indicated that estuary perch were generally most abundant in Gippsland estuaries, and that they grew and survived best in estuaries containing deep-channelled rivers and frequently or permanently open entrances. Little is known of the early life history stages of estuary perch, but nursery areas for small juveniles are thought to be in the upper reaches of estuaries. Larger juveniles and adult perch are known to be associated with submerged tree branches and seagrass beds where they can shelter and feed as ambush predators on smaller fish and crustaceans. Netting surveys of Anderson Inlet and the lower Tarwin River in the early 1980s (McCarraher, 1986) found estuary perch to be one of the most abundant fish species in the estuary at the time. One of the most popular fishing spots for this species in the inlet is 'The Snags', where erosion of the Point Smythe shoreline has resulted in trees being submerged. Australian salmon are migratory, schooling marine fishes found in coastal waters, bays and estuaries of southern Australia and up the east and west coasts to approximately 30°S(Kailola et al., 1993). Morphological and genetic studies (MacDonald, 1980, 1983) have confirmed two species of salmon in southern Australian waters - western salmon (Arripis truttaceus) in waters of Western Australia, South Australia, Victoria and Tasmania, and eastern salmon (A. trutta) in waters of southern NSW, Victoria and Tasmania. Western salmon predominate in western and central Victorian waters and are relatively common as far east as the Gippsland Lakes, while eastern salmon predominate in East Gippsland waters and are relatively common as far west as Port Phillip Bay. The two salmon species thus overlap in central Victorian waters (including Anderson Inlet) where they can be found mixed together in the same schools. Western salmon spawn between February and June in coastal waters of south-west Western Australia. Eastern salmon spawn in coastal waters of East Gippsland and southern NSW over the period November to April. In Victoria both western and eastern salmon up to 2+ years are found predominantly in bays and estuaries, often in association with seagrass beds. They can tolerate temperature and salinity extremes, such as the brackish and turbid waters of estuaries, or the hyper-saline waters of the South Australian gulfs. Western juveniles feed on bottom-dwelling prey such as fishes, crabs and shrimps. Eastern juveniles feed on zooplankton but are known to also prey on bottom-dwelling fauna such as fishes, squid, crustaceans and polychaete worms during winter months (Robertson, 1982). Larger juvenile salmon (>30cm length) move out of bays and estuaries into more exposed coastal waters, such as around rocky headlands and along surf beaches. Maturing salmon school up and move east or west along the southern coast to the respective spawning grounds of each species. Migrating schools of adult salmon will sometimes 'rest up' near the mouths of inlets such as Anderson Inlet, and may occasionally move into such inlets to feed. Trevally species of the genus Pseudocaranx are widespread in temperate and sub-tropical waters of Australia, New Zealand, the Indian Ocean and the Atlantic Ocean (James, 1984). Studies in the early 1990s revealed that silver trevally in Victorian, Tasmanian, South Australian and Western Australian waters consist of two very similar species, P. dentex and P. wrighti (Gomon et al., 1994). Juvenile silver trevally occur over soft substrates in estuaries, bays and shallow coastal waters, whilst adults are found either in shallow coastal waters or forming pelagic schools in deeper waters of the continental shelf (Last et al., 1983; James, 1976). Spawning occurs during summer (Lenanton, 1977). Adult fish in spawning condition have been recorded from both estuaries and offshore areas (Winstanley, 1985), but any spawning ground preferences have not been defined. Silver trevally can live for more than 40 years (James, 1978) and can grow to a maximum of 94 cm total length (Hutchins and Swainston, 1986) and up to 6.0 kg in weight (Last et al., 1983). However, trevally larger than about 38 cm length are uncommon in Victorian bays, estuaries and shallow coastal waters. Trevally are opportunistic carnivores, adapted to both benthic and planktonic feeding modes. The benthic diet consists primarily of polychaete worms, molluscs and small crustaceans, while surface schools of trevally consume planktonic crustaceans - particularly euphausids (krill). Juvenile trevally mainly consume micro crustaceans (Winstanley, 1985). Seasonal feeding preferences occur in adult trevally with a summer diet of essentially crustaceans shifting to mainly bivalve molluscs and teleosts in winter (Anon., 1981). King George whiting (Sillaginodes punctata) are endemic to marine embayments, marine sections of estuaries and shallow coastal waters of southern Australia from central NSW to the central west coast of Western Australia. The southern limit of the species' distribution is the north coast of Tasmania (Kailola et al., 1993; Gomon et al., 1994). Although small juveniles are common in tidal estuaries and creeks, this species is primarily a resident of marine waters, being unable to tolerate salinities much less than that of full sea water. King George whiting are found in most shallow, sheltered coastal waters of Victoria, but are most abundant in large marine embayments such as Corner Inlet/Nooramunga and Port Phillip Bay. Other species of whiting found in Victorian waters include the eastern school whiting (Sillago flindersi) and the east coast sand whiting (Sillago ciliata). Adult whiting in breeding condition, or small whiting less than about 100 days old, are virtually absent from bay and inlet waters of central Victoria. It has therefore been hypothesised that recruitment to these areas is derived from spawning in coastal waters to the west of Port Phillip Bay, and that recruitment from as far west as South Australian waters may be possible (Jenkins and May, 1994; Jenkins et al., 2000). Available evidence from studies of gonad maturation and ageing of post-larvae indicate that King George whiting spawn during autumn or early winter. To date the only known spawning area for King George whiting is open coastal waters of South Australia (Jones et al., 1990; Jenkins et al., 2000). The species has a long planktonic larval life, with post-larvae settling into very shallow, sheltered marine habitats in Victorian bays and inlets at 100 - 170 days of age (Jenkins and May, 1994). Juveniles remain in sheltered marine waters, usually in association with seagrass habitats, for 2-3 years, after which they begin to move to deeper, more open waters (Kailola et al., 1993). King George whiting have a reported maximum life span of 15 years (from scale ageing in South Australia), a reported maximum length of 72 cm and a reported maximum weight of 4.8 kg (Jones et al., 1990; McKay, 1992). However, few fish caught in Victorian bays and inlets exceed 40 cm total length or 1 kg. Prior to European settlement two main aboriginal groups utilised the natural resources of Anderson Inlet. These were the Yowenjene people, the most easterly clan of the Bunurong tribe, and the Jatowarawara, a clan of the Kurnai tribe of Gippsland. The Tarwin River divided the home ranges of these two groups (Chapman et al., 1987; Harrison et al., 1990; DNRE, 1998). The lower reaches of the Tarwin River provided the Yowenjene clan with a variety of foods including swan eggs, roots and plants, along with fish, eels, kangaroo and possums. Marine shellfish were also a popular choice for the Yowenjene clan with numerous middens found in close proximity to Venus Bay (Chapman et al., 1987). A dramatic decline in population numbers of both the Yowenjene and Jatowarawara clans coincided with the arrival of European sealers and whalers to the central Victorian coast in the early 1800's. This was thought to be due to conflict over resources as well as the introduction of disease (Chapman et al., 1987). Massola (1974) reported that by 1850 only a handful of the original population from the Jatowarawara and Yowenjene clans remained on the coast. A number of coastal shell middens have been reported in the Anderson Inlet area, particularly in the Cape Liptrap Coastal Park and also in the vicinity of Screw Creek. These middens contain the remnants of shellfish as well as other species like kangaroo and fish that were eaten by the local Aboriginal people over hundreds of years (AAV, 2002). No middens or other aboriginal cultural heritage sites have been reported from within the boundaries of the Anderson Inlet Fisheries Reserve area to date. Shell middens are thought to be amongst the most fragile sites of cultural significance due to their exposure to varied climatic conditions and human interference by unauthorised vehicle and pedestrian access. Measures recommended to prevent or mitigate damage to cultural sites have included stabilising the area by revegetation and controlling access through fencing of sensitive areas. Commercial fishing for finfish commenced in the mid-1800s and continued until 2000. The main fishing methods used by commercial fishers were mesh (gill) nets, haul seine nets and hand lines. The main species recorded from commercial catches were Australian salmon, yellow-eye mullet and silver trevally, and more recently estuary perch, luderick, rock flathead, bream and King George whiting. Catches were mostly sold as fresh table fish through the Melbourne markets or through local outlets. Available commercial fishing catch and effort data indicate that prior to World War II annual commercial catches from Anderson Inlet were mostly between 15,000 and 30,000 kg. From 1945 to the mid 1970s annual commercial catches were mostly between 5,000 and 15,000 kg. From 1980 to its closure in 2000 the Anderson Inlet commercial fishery produced annual catches that were consistently less than 5,500 kg. This declining trend in annual commercial catches is thought to be due to a combination of factors, including declining commercial fishing effort applied in the inlet, a decline in the capacity of the inlet to support fish populations due to habitat and environment changes, and increasing pressure on key fish stocks from the combined impacts of recreational and commercial fishing (Smith, 1991). Table 1 summarises mean annual commercial fish catches (kg) from Anderson Inlet between 1978 and 2000. The Table shows that during this last period of the commercial fishery yellow-eye mullet (46%) and estuary perch (18%) together accounted for nearly two thirds of total commercial catches from the inlet. There is still one fishing licence that permits commercial eel fishing and several licences that permit commercial bait fishing (mainly pumping for sand worm) in Anderson Inlet and/or the lower reaches of the Tarwin River. Anderson Inlet, particularly the Inverloch area, has been an increasingly popular recreational destination for visitors from Melbourne or the LaTrobe Valley since the late 1800s. The resident population of Inverloch is estimated to increase tenfold during the peak summer holiday period, and Venus Bay is becoming increasingly attractive as a holiday and retirement destination. The main attractions of the area are beach and water recreational activities, scenic landscapes and wildlife observation (DNRE, 1998). The main water-related activities undertaken in and around the inlet are beach walking, swimming, fishing, recreational boating, diving, use of personal water craft (jet skiing), water skiing, wake boarding, sailing, wind surfing, kite surfing and observation of water birds. Anderson Inlet is used for a number of watercraft activities. Sailboats, sailboards, and personal water craft are used predominantly in the lower half of the estuary wherever sufficient depth of water is available. Powerboats are used for water skiing purposes mainly in a deep channel adjacent to Point Smythe and in a designated area where the Tarwin River enters the inlet near Tarwin Lower. Canoeing and kayaking occurs throughout the inlet in suitable weather and tidal conditions. Dive charter operators normally take their clients to dive locations in open waters of the Bunurong coast, but will conduct dives inside Anderson Inlet, usually in the vicinity of Point Smythe, if diving conditions are unfavourable outside the inlet. The water area of Anderson Inlet, particularly at low tide, is relatively small. While the inlet has the capacity to support a variety of water craft activities, increasing demand for these activities - particularly during peak holiday periods - is leading to congestion. Watercraft can gain access to Anderson Inlet by coming in through the inlet entrance from coastal waters or by being launched from boat ramps located at Inverloch, Mahers Landing, the Tarwin River at Tarwin Lower, Fishermans Jetty (Venus Bay) or Flat Rocks (just outside the inlet). Access to the main channel may be restricted due to sand movement. The Inverloch boat ramp is popular due to good car/trailer parking facilities and the proximity of other retail and hospitality services, however boat launching and recovery can be difficult during peak periods and in adverse weather conditions. Mahers Landing is often used as an alternative by locals. Major shore-based activities identified by Harrison et al., (1990) and in the Inverloch Foreshore and Anderson Inlet Management Plan (DNRE, 1998) include walking, playing on the beach, swimming, snorkelling, diving, sunbathing and wildlife observation. Due to limited shore access around the inlet these activities are mainly concentrated in a few key areas including the Inverloch Foreshore, around boat ramps, the Tarwin River boardwalks, and the inlet shoreline of the Cape Liptrap Coastal Park including Point Smythe. Intensive use of these limited shore access locations within Anderson Inlet has in some cases resulted in environmental degradation, including vegetation removal and disturbance, erosion, uncontrolled vehicle and pedestrian access, and establishment of pest plants and animals (Harrison et al., 1990). Following the removal of commercial fishing (other than for eels and bait) from Anderson Inlet in 2000, and the declaration of the inlet as a fisheries reserve in 2003, the focus for fisheries management has shifted towards maintaining, and where possible improving, recreational fishing opportunities in the inlet. The following sections describe the policy framework, legislative tools, management processes and current controls that apply to recreational fishing in Anderson Inlet and other Victorian waters. Fishing activities in the Anderson Inlet Fisheries Reserve and in all Victorian public waters are managed under the provisions of the Fisheries Act 1995 (the Act) and the Fisheries Regulations 1998 (the Regulations). to encourage the participation of resource users and the community in fisheries management. The Act provides for the development, implementation and review of fisheries reserve management plans; facilitates participation of stakeholders in fisheries management via fisheries co-management arrangements; and prescribes enforcement powers to assist in achieving compliance with fishing controls. The Regulations prescribe detailed management arrangements for individual commercial and recreational fisheries, including licence requirements, restrictions on fishing equipment and methods, restrictions on fishing catch and/or effort (bag limits, size limits, closed seasons/areas), and penalties for breaches of fishing controls. It is important to note that the provisions of fisheries legislation (including Fisheries Notices) can only be applied to the control of fishing activities. Other human activities (eg. catchment land use, foreshore management, competing water-based recreational activities) that may directly or indirectly affect fish habitats, fishery resources or the quality of fishing, are managed by different agencies under a variety of other legislation. ensuring that the processes and procedures involved in management of a fishery are appropriate, transparent and inclusive. There is an expectation in Australia and worldwide that utilisation of fish resources will be managed according to these ESD principles, and they have been followed during the development of the AIFRMP. In November 2000, the Victorian Government signed a Native Title Protocol with the Aboriginal and Torres Strait Islander Commission (ATSIC) and the native title representative body, Native Title Services Victoria. The protocol agreed to the development of a Statewide policy framework to address a broad range of native title related issues, including fisheries. Initial discussions with stakeholder groups have been held to identify fisheries issues relating to native title. Victoria is currently working with Indigenous community representatives, other Australian fisheries authorities and other fishing stakeholders to develop a national set of principles and pathways to facilitate definition and lasting recognition of customary fishing practices; increased opportunities for economic engagement of Indigenous communities in fisheries-related enterprises; and increased Indigenous participation in all aspects of fisheries use and management. Indigenous support for such a framework will not affect the legal rights of Indigenous people or limit their scope to pursue other options. However, it is considered that such a framework will be better able to deliver practical outcomes within the foreseeable future than litigation. A Recreational Fishing Licence is required for angling, spear fishing, bait pumping, hand collecting and all other forms of recreational fishing in Victorian public waters, including Anderson Inlet. However, some sectors of the community, including people under 18 or over 70 years of age, holders of a Victorian Seniors Card, and recipients of various age, disability or veterans benefits, are exempt from the need to hold a licence to go fishing. The Regulations define "recreational fishing equipment" as including a rod and line, handline, dip/landing net, bait trap, spear gun, hand-held spear, bait pump, recreational bait net and recreational hoop net. Recreational use of any equipment not included in this definition is prohibited in all Victorian public waters. The maximum permitted dimensions of dip nets, bait traps, bait pumps, recreational bait nets and recreational hoop nets are prescribed in fisheries regulations and summarised in the Victorian Recreational Fishing Guide. While Anderson Inlet has been managed as marine waters in the past, its status as either marine or inland waters for the purposes of fisheries legislation needs to be more clearly defined. Legal minimum sizes, bag limits, possession limits (in, on or next to fishing waters) and vehicle limits for fin fish and invertebrate species that may be encountered by recreational fishers in Anderson Inlet are prescribed in fisheries regulations and summarised in the Victorian Recreational Fishing Guide. Some size and catch limits have been introduced as measures to protect fish stocks from heavy fishing pressure. However, many of these limits have been adopted on ethical or cultural grounds, such as the definition of a reasonable take for personal consumption. For some fish species with high commercial market value there is a requirement to retain captured fish in whole or carcass form until after they have been landed (brought ashore), in order to ensure compliance with recreational size and catch limits. Marine or estuarine fish species required to be landed in whole or carcass form include all shark species, elephant fish, King George whiting, bream, snapper and eels. In the case of sharks and elephant fish 'carcass' means a fish which has been gutted and headed forward of the first gill slit, but has not been skinned or filleted. In the case of scale fish 'carcass' means a fish which has been scaled and gutted, but has not been headed or filleted. Collection of most mollusc species from the intertidal zone of central Victorian waters - including Anderson Inlet - is prohibited. Mollusc species exempted from this ban include squid, cuttlefish, octopus, pipis and squirters. Dead shells may also be collected. The use of a scoop, dredge, fork, spade, rake shovel or other digging implement to collect invertebrate species from the intertidal zone throughout Victoria is prohibited. Use of a bait pump with a barrel diameter not exceeding 85 mm is permitted. The only types of fishing activities currently defined under the provisions of the Act and the Regulations are commercial fishing, recreational fishing and aquaculture. Access to Victorian waters for each of these types of fishing requires a licence (although some categories of recreational fishers are exempt from this requirement), and is subject to a range of licence conditions and/or regulations. Customary fishing practices by Indigenous Australians are not currently identified as a distinct type of fishing activity under Victorian fisheries legislation, and non-commercial fishing by Indigenous Australians is therefore treated as recreational fishing. The Act does, however, provide for the issue of permits to facilitate the taking of fish for specified Indigenous cultural ceremonies or events. The co-management of fisheries within Victoria is a process involving three groups. The first comprises the peak bodies, including VRFish. The second group comprises the Fisheries Co-Management Council (FCC) and its technical based committees. Finally, the third group is the government agencies, including DEDJTR of which Fisheries Victoria is a division. The above co-management entities will ensure that fisheries interests are appropriately acknowledged and represented during consultation processes regarding decisions that may impact on the fishery. Anderson Inlet and surrounds are home to a diverse range of aquatic and terrestrial flora and fauna, some of which has significant state, national or international conservation status. Significant stands of the white mangrove Avicennia marina occur at the mouth of Screw Creek and in the intertidal zone of the southern side of the Inlet around Griffith Point. Saltmarsh communities predominate along the rest of the southern shore of the inlet (Harrison et al., 1990; DNRE, 1998). Seagrass beds occur in parts of Anderson Inlet and are thought to provide important habitat, feeding and nursery grounds for a range of aquatic biota, including fish species. Key objectives and strategies for protection of biodiversity in and around Anderson Inlet are described in the Inverloch Foreshore Reserve and Anderson Inlet Management Plan (DNRE, 1998) and in relevant sections of the Cape Liptrap Coastal Park Management Plan (Parks Victoria, 2003). The foreshores of Anderson Inlet are subject to a variety of recreational and commercial uses and activities. The Inverloch foreshore from Point Norman to the mouth of Screw Creek is the most intensively used area in the inlet for shore-based recreational activities, including walking, swimming, picnics, fishing, snorkelling and nature appreciation. Elsewhere shore-based recreational activities tend to be concentrated around boating access points, such as Mahers Landing, Tarwin Lower and Fishermans Jetty (Venus Bay). Several fishing platforms and a boardwalk permit access to the southern bank of the Tarwin River at Tarwin Lower, and to sections of Screw Creek east of Inverloch. The Tarwin Lower platforms and boardwalk were originally constructed by a local community group using materials purchased by Parks Victoria, and are in a state of disrepair due to lack of maintenance. The West Gippsland Catchment Management Authority (WGCMA) has recently secured funds from the Recreational Fishing Licence Trust Account to reconstruct and upgrade these river access facilities to support fishing access and protect the banks and riparian vegetation of the Tarwin River. Much of the shoreline of the upper part of the inlet and the lower reaches of the Tarwin River is inaccessible for shore-based recreational purposes, either because of the presence of fringing wetlands (salt marsh, reeds, mangroves, mud flats), or because there is no public access through adjacent private land. Land-based access to the southern shoreline of the inlet is available through Cape Liptrap Coastal Park. Strategic directions identified in the Victorian Coastal Strategy (VCC, 2002) and the Gippsland Coastal Action Plan (GCB, 2002b) include a requirement that public access to coastal Crown land will be maintained, except where the interests of security, safety or protection of coastal resources predominate. The Strategy also specifies that public access to existing shore-based fishing facilities such as piers, jetties and wharves will be maintained except where safety and security issues predominate. New structures will accommodate access for fishing where appropriate. Anderson Inlet (Inverloch, Venus Bay) has been designated as a local port which is managed by Gippsland Ports in accordance with the Port Services Act 1995 and the Port Services (Local Ports) Regulations 2004. Boating activities in Anderson Inlet are regulated under the provisions of the Marine Act 1988, administered by Marine Safety Victoria (MSV). Recommendations to MSV for changes to boating regulations in places such as Anderson Inlet may arise through public consultation processes conducted by organisations such as local Councils or Gippsland Ports. The Gippsland Boating Coastal Action Plan (GBCAP) (GCB, 2002a) provides direction for the location and scale of boating use and development on the Gippsland coast. It also provides a framework for ensuring coordination between conflicting uses and users of Gippsland waters. The GBCAP identifies that appropriate boating activities for 'coastal estuaries' such as Anderson Inlet are active non-powered (eg. sailing, sail boarding), passive non-powered (eg canoeing, kayaking) and passive powered boating (eg. fishing, sightseeing). Active powered boating (eg. water skiing, personal water craft, fast cruising, boat racing) is identified as being appropriate in lakes (inland or coastal) and marine waters. The Inverloch Foreshore Reserve and Anderson Inlet Management Plan (DNRE, 1998) indicates that power boating, water skiing and personal water craft (PWC) should be permitted in designated areas of Anderson Inlet provided environmental impacts of these activities and conflicts with other inlet users are minimised. The plan specifies that the environmental impacts of these activities should be monitored, and that these activities should be banned if the impacts cannot be controlled or other appropriate locations cannot be found. Installation, maintenance and management of boat launching facilities around Anderson Inlet is generally the responsibility of local government and/or Committees of Management. Installation, maintenance and management of navigational aids in the inlet, and the jetties associated with the Inverloch and Fishermans Jetty (Venus Bay) boat ramps and including the Tarwin River Jetty, are the responsibility of Gippsland Ports. The GBCAP (GCB, 2002a) identifies the Inverloch boat ramp as being suitable for local use by boats up to about seven metres length. The GBCAP recognises that sand build up is a problem at this facility, but also indicates that there is little that can be done to prevent this build up, and that there is no other location near Inverloch that would be more suitable or would have less sedimentation problems. The GBCAP also identifies the Fishermans Jetty (Venus Bay) boat ramp as being suitable for boats up to seven metres, and the facility is assessed as being adequate to meet local demand for the time being. However, the boat ramp and the access channels are acknowledged to be subject to siltation problems that cannot be remedied at reasonable cost. The GBCAP further identifies the boat ramp at Tarwin Lower as being suitable for boats up to five metres, and the facility is assessed as being adequate to meet local demand for the time being. The WGCMA was formed under the provisions of the Catchment and Land Protection Act 1994 and the Water Act 1999 and works with regional community, industry and government stakeholders to coordinate the development of strategies for integrated management of land and water resources, waterways and living natural resources in West Gippsland - including Anderson Inlet and tributaries. The West Gippsland Regional Catchment Strategy (RCS) (WGCMA, 2004a) and the West Gippsland Regional River Health Strategy (WGCMA, 2004b) identify valuable land, water and living natural resource assets, assess the condition of and identify threats to the maintenance of these assets (including identification of knowledge gaps), and provide directions on actions required to manage land (both public and private), water and biodiversity. the introduction of pest plants and animals and their impacts on environment and natural resource production. Implementation of management actions in the West Gippsland RCS will be reliant on a number of agencies and key stakeholders within the region, including DSE, DEDJTR, Environment Protection Authority (EPA), local government, private landholders and community-based programs such as Landcare, Coast Action/Coastcare and Waterwatch. establish water quality monitoring programs. Introduction of marine pests has been identified as a potentially threatening process under the Flora and Fauna Guarantee Act 1988. Marine pest emergency arrangements known as the "Interim Victorian Protocol for Managing Exotic Marine Organism Incursions" currently forms the basis for responding to introductions and incursions of pests. Introduction and spread of the introduced rice grass/cord grass Spartina in Victorian estuaries, and the introduction of exotic organisms to Victorian marine waters, have both been listed as 'Potentially Threatening Processes' under the provisions of the Flora and Fauna Guarantee Act 1988. This Act, administered by the Department of Sustainability and Environment (DSE) requires that Action Statements be developed describing how these threats are to be addressed in Victoria. The Inverloch Foreshore Reserve and Anderson Inlet Management Plan (DNRE, 1998) identifies the need to develop a co-ordinated Spartina control program in the inlet; to monitor the small Pacific oyster population in the inlet; and to develop appropriate response plans in the event that other pest species such as northern Pacific seastar or the algae Undaria are introduced to the area. In recent years Parks Victoria, assisted by the WGCMA, has conducted a Spartina control program using herbicide and a hovercraft in selected areas of the inlet. This program has had limited success, but is unlikely to arrest the continued expansion of Spartina without a significant increase in resources. In December 2003, the northern Pacific seastar was found in small numbers at the entrance to Anderson Inlet. The DSE and Parks Victoria coordinated a response to this incursion, including a widely acclaimed community-based diving program to search for and remove all seastars in the area before the commencement of the spawning season. Monitoring will continue to determine whether the eradication program has been successful. Experience from northern Pacific seastar incursions in Port Phillip Bay and elsewhere indicates that this species has the potential to threaten aquatic biodiversity, including fish, directly through predation on benthic eggs and larvae, and indirectly through competition for food items such as molluscs, crabs and other marine invertebrates (CSIRO, 2000). A population of Pacific oysters has been present off Point Smythe for at least 20 years. Experience from infestations of this species elsewhere indicates that it has the potential to colonise extensive areas of mudflats and may displace native aquatic invertebrates and waterfowl. Pacific oyster colonies also make recreational access difficult and interfere with bait collection activities. Monitoring of this population has indicated that, to date, it has not shown any signs of further incursions of other areas inside the inlet. At present, monitoring of this population is continuing. The overall purpose of the AIFRMP is to formalise management arrangements for the Anderson Inlet Fisheries Reserve in accordance with the provisions of the Act, the Ministerial guidelines and the principles of Ecologically Sustainable Development (ESD). To this end, the AIFRMP specifies goals, objectives, strategies and actions for management of fishing activities in the reserve. The AIFRMP also identifies processes for management of other non-fishing values and uses of the inlet, and opportunities for fisheries stakeholders to participate in these processes to ensure identification and minimisation of potential adverse impacts on fish habitat and fisheries. The AIFRMP contains a section describing research and monitoring information needed to address the identified management objectives and performance indicators; a section outlining a strategy for promoting compliance with fishing controls in the inlet; and a section describing implementation and future review processes. The AIFRMP will provide the basis for the management of the Anderson Inlet Fisheries Reserve for a period of 10 years unless established fishery monitoring and assessment programs indicate a need for a review prior to that time. Review of the AIFRMP and preparation of a new AIFRMP will commence twelve months prior to the schedule expiry of the AIFRMP. The review will examine all aspects of fisheries management against the defined goals, performance indicators and reference points, and will examine the need for new or amended objectives in light of monitoring and research information obtained. Should there be a need for the Minister to amend the AIFRMP prior to this review, notice of this intention will be published in the Government Gazette. The Act stipulates that a management plan must be prepared for a fisheries reserve as soon as possible after the Reserve has been declared under Section 88 of the Act. as far as relevant and practicable, identify any other biological, ecological, social and economic factors relevant to the fishery or fisheries covered by the plan - including fishery trends and current status; the socioeconomic benefits of fishing and other human uses of the area or resources in question; measures to minimise the impact of fishing on non-target species and the environment; fisheries-related research needs and priorities; and an assessment of the resources required to implement the fisheries management plan. include any other relevant matters. Additional direction on the development of the AIFRMP has been provided by the gazettal of Ministerial guidelines on 30 October 2003 (see Appendix 2). The AIFRMP was prepared by Fisheries Victoria, assisted by a steering committee comprising of an independent chair and representatives from key stakeholders including the VRFish, FCC, WGCMA, Indigenous interests, Parks Victoria, Bass Coast Shire, South Gippsland Shire Council and the department. The role of the steering committee was to advise the Executive Director, Fisheries Victoria, DEDJTR, on the preparation and consistency of the AIFRMP with respect to the requirements of the Act and the Ministerial guidelines, and to respond to community consultation on the draft AIFRMP. Terms of Reference for the steering committee and a list of the organisations' representatives are found in Appendix 3. The first step in the development of the AIFRMP was to seek the views of recreational fishers and other community interests regarding values and issues associated with fishing in Anderson Inlet. In January 2004, a public meeting was held in Inverloch to canvass these issues. Recreational fishers and members of the public who were unable to attend the Inverloch public meeting were invited to provide written submissions by the end of February 2004. Approximately 40 verbal and written submissions were received from this round of consultation, providing a range of views on values and issues associated with recreational fishing in Anderson Inlet. This information helped to guide the drafting of the AIFRMP so that it had a strong focus on addressing fishing-related issues that matter to both visiting and resident recreational fishers and the local community. competition and conflict between recreational fishers and other water-based users of Anderson Inlet. To manage Anderson Inlet fish stocks, the habitats and aquatic environment on which they depend, and the fisheries they support, in a manner that is sustainable and which ensures maximum social and economic benefits to all Victorians in accordance with ESD principles. Social - To maintain and where possible enhance recreational fishing opportunities in Anderson Inlet. Biological - To conserve and ensure sustainable use of key fish stocks in the inlet. Environmental - To promote protection of the habitats and environments which are essential for production or maintenance of key fish stocks in the inlet. Governance - To achieve maximum community participation, understanding and support for the management of fishing activities in the Anderson Inlet Fisheries Reserve. More detailed accounts of the strategies, management actions, performance indicators and information needed to address each of these objectives are provided in the following sections and are summarised in Table 2. Performance indicators are provided for actions that Fisheries Victoria has direct responsibility for implementing. These indicators provide a means of tracking progress on an ongoing basis. Performance indicators are not provided for actions that other agencies are responsible for implementing. to identify non-fishing factors (eg boat and shoreline access) that may directly affect recreational fishing opportunities in the inlet and provide information to facilitate participation by recreational fishing interests in management process for these factors (Strategy 9). to ensure that concerns regarding the consequences of these factors for fish habitat and therefore fisheries are identified and considered in the appropriate management forums (Strategies 7 & 8). Apart from a limited survey (monthly daytime angler counts, on-site interviews and examination of angling club records) in the late 1980s and early 1990s (Smith, 1991), there has been no systematic monitoring of recreational fishing in Anderson Inlet. More detailed and up-to-date information is needed on the demographic profile of Anderson Inlet fishers (eg. proportion of visitors versus local residents; residential origins of visitors) and on the values they attach to fishing in the inlet (eg. preferred target species; preferred fishing methods/locations/seasons; acceptable catch rates for particular species). This information is needed in order to determine what constitutes a satisfying recreational fishing experience in the inlet, and therefore what management actions might be taken to maintain or enhance fishing opportunities. good infrastructure and services - particularly in Inverloch - to support fishing activities. Information on profile of recreational fishing is collected from at least 200 anglers. Fisheries Victoria to seek funding to establish periodic surveys of anglers to provide information on fishing values. The first survey to be conducted within the first two years following declaration of the AIFRMP and a minimum of one additional survey in the remaining life of the AIFRMP. Fisheries Victoria, in consultation with recreational fishing stakeholders, to evaluate possible fishery management actions to maintain or enhance recreational fishing opportunities based on the results of surveys. a minority of submissions proposed that stricter size and/or catch limits for particular species (including estuary perch, bream and Australian salmon) would reflect the special status of the Anderson Inlet Fisheries Reserve, and would enhance the recreational fishing experience for these species. A minimum of 60% of fishers satisfied with fishing opportunities. Surveys of representative samples of Anderson Inlet recreational fishers are needed to provide information on the demographic profile of participants and on fishing values associated with fishing in the inlet. These surveys need to be conducted periodically to initially benchmark and then detect any changes in levels of fishing satisfaction, or in fishing values that underpin perceptions of satisfaction. The most cost effective collection of such information is likely to be through periodic attitudinal surveys at fishing access points around the inlet (for visiting and local non-club fishers) and through direct survey of local fishing club members. Fisheries Victoria to seek funding to establish periodic surveys of anglers to provide information on levels of fishing satisfaction. The first survey to be conducted within the first two years following declaration of the AIFRMP and a minimum of one additional survey in the remaining life of the AIFRMP. Where information collected during periodic angler surveys indicates support for a review of recreational fishery management arrangements in order to maintain or enhance fishing opportunities and experiences, Fisheries Victoria will evaluate possible fishery management actions in consultation with stakeholders. Many regulations applying to recreational fishing in Victorian waters have been introduced at the request of recreational fishers for ethical or cultural reasons, rather than because of an identified need to protect fish stocks from excessive fishing pressure. A number of bag limits have been introduced or amended to define a 'reasonable' daily take for personal use, and some size limits have been introduced to define minimum acceptable sizes for human consumption. Regulations introduced or amended for these reasons have in nearly all cases been applied uniformly to all Victorian waters. Preliminary information obtained from verbal and written submissions during the first phase of public consultation in January/February 2004 indicated that a majority of recreational fishers did not wish to see any changes to existing recreational fishing regulations in Anderson Inlet. However, several submissions called for changes to catch limits and/or size limits for particular species - including estuary perch, bream, Australian salmon, flathead, King George whiting, Bass yabbies and sand worms - for ethical or cultural reasons. Such reasons include defining a 'reasonable' number of fish to take for personal use in a days fishing, or defining the minimum size of a particular type of fish that is acceptable for eating purposes. Victorian recreational fishing catch limits were revised in 2000 after a four year review process that included extensive consultation with the Victorian Recreational Fishing peak body (VRFish) and several rounds of public comment on proposed catch limits. Current bag/possession limits for estuary perch, bream (except in the Gippsland lakes), Australian salmon, flathead (other than dusky flathead), King George whiting and sand worms were established on the basis of what the majority of Victorian recreational fishers considered to be reasonable, desirable or acceptable. More recently further requests have been made by recreational fishers for Statewide reviews of catch or size limits of particular species for ethical or cultural reasons. These requests will be considered in consultation with VRFish and the recreational fishing community during a review process to be initiated in 2006. In view of the above, the AIFRMP will not initially contain any changes to recreational catch or size limits that are proposed for ethical or cultural reasons. Recreational fishers have also contributed to the identification of responsible fishing behaviour through the development of a Victorian Recreational Fishing Code of Conduct. This document was released by VRFish in 2004 and provides guidance to recreational fishers on issues such as protecting the environment, respecting the rights of others, attending fishing gear, being aware of and complying with fishing restrictions, returning unwanted fish to the water, valuing fish caught and passing on knowledge to new fishers. Fishing restrictions introduced to identify and encourage responsible recreational fishing behaviour will reflect the views/values of a majority of recreational fishers. VRFish to facilitate the distribution of the Victorian Recreational Fishing Code of Conduct through outlets in the region, including through Fishcare groups, agents who sell fishing licences, and fishing clubs. Where information collected during periodic angler surveys (Strategy 1 & 2) indicates support for a review of recreational fishing restrictions, Fisheries Victoria will consider this information in future reviews of catch or size limits, within twelve months following the collection of information in periodic angler surveys. Such changes may apply specifically to Anderson Inlet, but are more likely to apply Statewide. No changes to recreational catch or size limits for ethical or cultural reasons are currently proposed for Anderson Inlet. The Anderson Inlet recreational fishery is small by comparison with other recreational and commercial fisheries under Victorian jurisdiction. The fishery is also complex, being characterised by targeting of a variety of fish species using several different fishing methods, and by substantial fluctuations in fish abundance that can be driven as much by habitat and environment conditions as by the effects of fishing. Objectives, strategies and performance indicators for sustainable use of Anderson Inlet fish resources will therefore need to be achievable and cost effective given limited resources for fishery monitoring, assessment and management (see Newman et al., 2003). There has been no systematic monitoring of recreational fishing in Anderson Inlet apart from limited surveys in the late 1980s and early 1990s (Smith, 1991). More detailed and up-to-date information is needed on recreational fishing catch and effort in Anderson Inlet to identify key target species and to establish fishery trends in the inlet. This information is essential to develop more specific sustainability objectives for the fishery and to provide the capacity to detect changes in the fishery that may require management responses. Establishment of a fishery catch and effort monitoring program in Anderson Inlet to allow identification of key target species and ongoing assessment of fishery trends. Ongoing or periodic surveys of recreational fishing activities in Anderson Inlet are needed to provide time series of information on preferred target species and to detect changes in catch and effort trends for key species. The most cost effective collection of such information is likely to be through creel surveys at access points around the inlet (for both visiting and local non-club fishers) and/or through establishment of angler diary programs in cooperation with members from local, and possibly some visiting, fishing clubs. Fisheries Victoria to seek funding to establish angler log book and periodic creel survey programs to provide information on preferred target species and catch and effort trends. The first creel survey to be conducted within the first two years following declaration of the AIFRMP, and a minimum of one subsequent creel survey in the remaining life of the AIFRMP. Fisheries Victoria to review adequacy of existing fishery management arrangements once information is available from fishery monitoring programs. Currently, no information is available on the structure, productivity or status of target fish species in Anderson Inlet. Information on reproduction, growth and recruitment patterns for each key species, together with fishery catch and effort information, is essential to detect fluctuations in abundance (whether driven by environmental or fishing factors) and to decide whether or not adjustments to fishery management arrangements are needed to ensure continued sustainable use. In small estuarine fisheries such as Anderson Inlet where the resources available for fishery monitoring, assessment and management are limited, more detailed investigations of stock status can only be justified for the one or two most important target species. Preliminary information obtained from recent public consultations indicates that estuary perch and Australian salmon are the two most popular recreational target species in Anderson Inlet. This assessment will be reviewed when more detailed information on targeting preferences becomes available from future fishery monitoring programs. Australian salmon are marine species that spawn in open coastal waters and utilise bays and inlets as juvenile nursery grounds, and occasionally as feeding grounds for migrating adults. The abundance of salmon in Anderson Inlet (and the quality of salmon fishing) is therefore dependent as much on factors outside the inlet determining reproductive success and migration, as it is on the impacts of fishing or environmental factors in the inlet. Estuary perch, however, normally spend their entire life cycle in estuaries such as Anderson Inlet, and consequently their abundance is likely to be determined almost entirely by environmental and/or fishing factors in the inlet. Resources available for stock assessment in Anderson Inlet will therefore initially be focused on estuary perch. The abundance of successive year classes of estuary perch in Victorian estuaries is known to vary substantially, probably as a result of fluctuating habitat and/or environmental conditions determining the success of spawning and the survival of young fish. Regardless of the reasons for these fluctuations in year class abundance, patterns of 'strong' and 'weak' year classes can be monitored as they grow and enter (i.e. are 'recruited' to) the fishery. Knowledge of recruitment patterns can be used to adapt fishery management arrangements so that full advantage is taken of periods of strong recruitment while avoiding excessive fishing pressure during periods of poor recruitment. Establishment of recruitment monitoring programs in Anderson Inlet to facilitate stock assessment and adaptive fishery management of key target species identified in Strategy 4. Based on current information available the immediate need is to establish ongoing or periodic sampling of the estuary perch population in Anderson Inlet and its tributaries to provide a time series of information on size and age composition, and thus on the relative abundance of successive year classes. Information is needed for pre-recruit fish (smaller than the legal minimum size) as well as recruited fish to provide a capacity to predict changes in fishery conditions and plan appropriate management responses. Options for collection of such information include sampling of estuary perch recreational catches during creel surveys, recruitment of avid estuary perch anglers to provide detailed information on both legal size and undersize perch via 'research' diaries, and fishery-independent scientific surveys of perch in the inlet. Fisheries Victoria to seek partnership funding to establish ongoing and periodic fishery catch sampling programs and/or fishery independent surveys to provide information required for assessment of estuary perch stocks every three years. Subject to funding, first survey to be conducted within first two years following declaration of the AIFRMP, and a minimum of one subsequent survey in the remaining life of the AIFRMP. If monitoring of estuary perch stock status in Anderson Inlet indicates a need to modify fishery management arrangements to ensure sustainable catches in the inlet, then such changes will be proposed by Fisheries Victoria. Although the mouth or entrance to Anderson Inlet has often been assumed to be a line from Point Smythe to Point Hughes (see Figure 1), the precise location of this boundary has never been clearly defined for fisheries management purposes. Commercial fishing in Anderson Inlet ceased in 2000, but some recreational fishers remain concerned that commercial fishing for migratory species such as salmon in open coastal waters - particularly adjacent to the mouth of Anderson Inlet - may reduce migration of these species into the inlet, and thus reduce recreational fishing opportunities. Examination of mandatory commercial fishing catch and effort information provided by commercial licence holders suggest it is unlikely that commercial fishing for salmon and other migratory species near the entrance to Anderson Inlet has significantly impeded migration of salmon into the inlet in recent years. Nevertheless it is still considered appropriate to clarify the seaward boundary of the Anderson Inlet Fisheries Reserve by establishing a more precise definition of the mouth of the inlet. Clarifying this boundary should limit disputes between recreational fishers utilising the inlet and commercial fishers licensed for ocean access in areas adjoining the inlet. It is also necessary to clarify the status of Anderson Inlet as either inland or marine waters in order to determine appropriate controls on levels of recreational fishing equipment. In addition, implementation of strategies 4, 5 and 7 will progressively establish information to provide for identification of priorities for management actions to protect stocks of key recreational fish species and their supporting habitats in the inlet. This information can progressively be incorporated into the management of the fisheries reserve by adopting an adaptive management approach that regularly reviews current resource information and develops appropriate management responses during the life of the plan. The AIFRMP recognises that such an approach may require the development of interim protection measures to ensure the protection of the inlets valuable fish resources. These measures may include the establishment of fisheries notices, the establishment of permits by the Secretary of the department and the redirection of management effort. These legislative and departmental protection measures will require the seaward boundary of the inlet to be clearly defined. The seaward boundary of the Anderson Inlet Fisheries Reserve and the inland or marine waters status of the inlet are clearly defined for fisheries management purposes within the first three years of declaration of the AIFRMP and an adaptive management approach adopted to take account of new resource information established under Strategies 4, 5 and 7.
formally identify the inland or marine status of the waters of Anderson Inlet. Fisheries Victoria to develop adaptive management processes as new resource information becomes available. There is increasing evidence worldwide that the sustainable use of any fishery resource is dependent not only on controlling the direct impacts of fishing on fish stocks, but also on maintaining the integrity of the aquatic habitats, environmental conditions and ecological processes that are crucial for the production and/or survival of target fish species. This is particularly so in inshore marine, estuarine and inland waters that are facing increasing pressures from human population growth and associated agricultural, industrial, urban and tourism development. The need to identify and protect important fish habitat has been recognised and included as an objective of the Act, and in the Ministerial guidelines for the development of a fisheries reserve management plan for the Anderson Inlet Fisheries Reserve. the main threats (whether from fishing or other non-fishing human activities) to the integrity of each key fish habitat. Direct management action can be taken under fisheries legislation to minimise or eliminate any identified threat to fish habitat from fishing activities. However, persuading other management agencies to ameliorate impacts or threats to fish habitats from non-fishing activities (eg. excessive nutrient/sediment inputs, introduction of exotic pest species, foreshore development/ modification, pollution) will require at least some specific knowledge of the likely extent of impacts on fish habitats and therefore production of fisheries resources, and thus the likely reduction in associated fishery values. In 1995, Fisheries Victoria established a formal Fish Habitat Assessment process to provide scientific information on the location and status of key marine and estuarine fish habitats, as an input to the development or review of fishery management arrangements. This process involves the participation of stakeholder representatives, scientists and fishery managers in fish habitat assessment workshops, and the publication of workshop findings in the Fisheries Victoria Assessment Report Series. The inaugural Anderson Inlet Fish Habitat Assessment workshop was held in February 2001 (Nicholson and Gunthorpe, in press). The workshop identified habitat types that are potentially important for key target fish species - including seagrass beds, unvegetated soft bottom areas, submerged woody debris ('snags'), intertidal mangrove areas, salt marshes and rocky reefs (near the entrance). The workshop also identified potential major threats to these fish habitats including introduced pest species (particularly Spartina), excessive sediment and nutrient inputs and associated water quality problems, and physical disturbances from recreational boating and foreshore development activities. The workshop found that more scientific information on the importance of fish habitats, their current status, and threats to their integrity, was needed to identify effective management action to maintain fish habitat within Anderson Inlet. Notwithstanding this, any further loss or deterioration of these habitats can only have a detrimental impact on the capacity of Anderson Inlet to sustain production of fish resources. Varying amounts of information are available on the general ecological characteristics and habitat requirements of fish that are key fishery target species in Anderson Inlet (estuary perch, Australian salmon, silver trevally, black bream, sand flathead and yellow-eye mullet). However, little is known of the specific habitat associations of these species in Anderson Inlet. Therefore identification of key fish habitats in the inlet, and management actions needed to protect these habitats, is unclear. A first step towards addressing this issue is to determine which habitats in the inlet (eg. seagrass/algae beds, unvegetated sand/mud areas, mangroves, Spartina-affected areas) are being used by or are important to various life history stages of the key target fish species - particularly juvenile estuary perch. Such a survey will also provide an assessment of the extent to which fish use or avoid Spartina habitat, and thus the consequences for fisheries resource production if Spartina continues to spread in the inlet. Sufficient information on fish/habitat associations in Anderson Inlet is collected to allow identification of important habitats for key target fish species within the first twelve months of the declaration of the AIFRMP. Seasonal field sampling over one year to determine the extent to which various life history stages of key target fish species use or are associated with different habitats in Anderson Inlet. This information will help to identify habitats that are vital to the production and/or survival of key fisheries resources, and thus focus efforts to identify management actions needed to protect such habitats. Fisheries Victoria to establish partnerships with WGCMA to seek co-funding through the Regional Catchment Investment Plan (RCIP) to establish a habitat survey to identify important habitat for key target fish species. Identification of key fish habitats in the inlet will provide a focus for assessment of threats to the integrity of these habitats. Direct management action can be taken under fisheries legislation to minimise or eliminate any identified threat to fish habitat from fishing activities. However, any identified threats to fish habitats from non-fishing activities (eg. excessive nutrient/sediment inputs, introduction of exotic pest species, foreshore development/ modification, pollution) will need to be addressed through the formation of partnerships with other management agencies (eg. catchment management authority, water authority, local government and other foreshore management bodies, DSE public land management and biodiversity protection agencies). Ensuring strong fisheries advocacy is provided during the development and review of catchment and waterway management strategies and programs developed by the WGCMA provides a major opportunity to positively influence fish habitat outcomes in Anderson Inlet. No changes to fisheries management arrangements for Anderson Inlet are proposed for the time being. Once habitat information is identified, the Anderson Inlet Fisheries Reserve Reference Group (page 43) will identify key projects and opportunities to maintain and enhance fish habitat as a part of an ongoing program of engaging other agencies which have responsibility for management for non-fisheries impacts. Known or potential effects of catchment activities on fish habitat and fish stocks in Anderson Inlet are described in the 'Current Management' section of the AIFRMP, together with catchment and waterway management responsibilities and relevant strategic management documents. Information and advice is provided to WGCMA and other agencies. Fisheries Victoria to provide available habitat information and advice during the development and review of the West Gippsland RCS and Regional River Health Strategy, within six months of completion of the research. VRFish, on behalf of recreational fishers and with assistance from Fisheries Victoria, to develop partnership arrangements with the WGCMA and other agencies to ensure that potential adverse impacts of catchment, land and waterway use activities on fish habitat and fisheries in Anderson Inlet are adequately considered in the development of programs in support of these two strategies. Where appropriate, Fisheries Victoria to provide policy and technical advice to WGCMA and other agencies to assist them to identify and develop priority projects and programs to ameliorate or prevent adverse impacts of catchment, land and waterway use activities on fish habitats and fisheries in Anderson Inlet. Known or potential effects of aquatic pest invasions on fish habitat and fish stocks in Anderson Inlet are described in the 'Current Management' section of the AIFRMP, together with pest species management responsibilities and existing aquatic pest management or prevention programs. Persons or groups seeking further details of existing aquatic pest management programs, or wishing to participate in the conduct or review of such programs to seek more favourable outcomes for fish habitat protection in Anderson Inlet, should contact Parks Victoria or the Department of Sustainability and Environment (DSE) for more information. Meetings held annually between Fisheries Victoria, VRFish, Parks Victoria and WGCMA with agreement on priorities for Spartina control and support given to funding applications addressing these priorities. Fisheries Victoria and VRFish, on behalf of recreational fishers, to work with Parks Victoria and the WGCMA to identify funding opportunities to expand the Spartina control program currently undertaken by Parks Victoria, and to identify priorities for action to protect fish habitat and angler access threatened by Spartina. Funding applications submitted and action plan priorities to be completed prior to annual budget processes. Proposals for residential or tourism developments around Anderson Inlet will be subject to local and/or state government planning approvals under the provisions of the Planning and Environment Act 1987. If the potential environmental impacts of the proposed development are significant then the proposal will be subjected to an Environment Effects Statement (EES) process under the provisions of the Environment Effects Act 1978. Venus Bay has been identified as one of three locations in Victoria containing Actual Acid Sulfate Soils (AASS) as a result of soil disturbance and/or exposure. AASS has the capacity to lower the pH of water and as a result, have significant impacts on the survival and/or production of fish resources. For any given development proposal both the planning approvals and the EES process will normally include public consultation phases, providing an opportunity for any person or group to ensure that possible adverse impacts on fish habitat and fish stocks, eg through exposure and/or disturbance of AASS are identified and properly assessed as part of the approvals process. Persons wishing to participate in such processes should contact the relevant Shire Council (if the proposal is subject to local government approvals), or the DSE (if the proposal is subject to State Government approvals), or they should follow advertised public consultation procedures. VRFish, with assistance from Fisheries Victoria, to engage relevant approvals authorities to ensure that potential adverse impacts of any proposed foreshore urban or tourism developments on fish habitat and fisheries in Anderson Inlet are identified and properly assessed during environment impact assessment processes. Known or potential impacts of boating and other water-based uses on fish habitat in Anderson Inlet and the lower Tarwin River include bank erosion from boat wakes; propeller or hull damage to intertidal seagrass beds or mud flats from boating in very shallow waters; and hydrocarbon pollution. Responsibilities for management of boating in the inlet (Marine Safety Victoria, Gippsland Ports, Parks Victoria, local Councils), provision of navigational aids (Gippsland Ports) and protection of waterways from boating impacts (WGCMA) are described in the 'Current Management' section of the AIFRMP, together with relevant strategic management documents. VRFish, with support from Fisheries Victoria and other water-based recreational user groups, to engage relevant waterway authorities to ensure that adequate boating navigational facilities are provided in Anderson Inlet and that any potential adverse impacts of boating on fish habitat and fisheries in the inlet are identified and minimised. Responsibilities for provision and maintenance of boat launching facilities (local government, Committees of Management), and associated jetties and navigational aids (Gippsland Ports) in Anderson Inlet are described in the 'Current Management' section of the AIFRMP, together with relevant strategic management documents and processes for funding such activities. Persons or groups seeking more information on boating facilities programs, or who wish to propose improvements to boating or navigational, facilities in the inlet should contact the appropriate authority. VRFish, and other water craft-based recreational user groups, to engage relevant foreshore management authorities to identify needs and seek funding to maintain or enhance boating access facilities in Anderson Inlet. As described earlier in the AIFRMP, Anderson Inlet is becoming increasingly popular for a variety of water-based recreational activities - including fishing - particularly during peak tourism periods. To avoid increasing congestion and conflict over competing shore-based and boatbased activities it is necessary to consider restricting or even prohibiting some activities in some locations. Responsibilities for management of foreshores (local government, Committees of Management, Parks Victoria, DSE) and water craft activities (Marine Safety Victoria, Gippsland Ports, local government, Parks Victoria) are described in the 'Current Management' section of the AIFRMP, together with relevant strategic documents and detailed proposals for management of competing uses in some areas. Persons or groups seeking more information on foreshore or water craft management arrangements in the inlet, or who wish to participate in management review processes to ensure that fishing activities are not unnecessarily constrained, should contact the appropriate authority. VRFish, on behalf of recreational fishers, to engage relevant foreshore and waterway management authorities to ensure that fisheries interests are properly considered in any management arrangements designed to alleviate congestion from competing waterbased activities in Anderson Inlet. Access to the foreshores of Anderson Inlet for shore-based fishing - including the provision of fishing platforms - is described in the 'Current Management' section of the AIFRMP, together with relevant strategic management documents and processes for funding shore-based fishing facilities. Persons or groups seeking clarification on public access to specific parts of the inlet for shore-based fishing should contact the relevant foreshore manager (local government, Committees of Management, Parks Victoria, DSE). Persons or groups who wish to propose improvements to shore-based fishing facilities in the inlet (eg. new or upgraded fishing platforms) should contact the relevant Shire Council (Bass Coast or South Gippsland) or the WGCMA for advice and assistance. VRFish, on behalf of recreational fishers, to engage relevant foreshore and waterway management authorities to resolve shorebased fishing access issues and to seek funding to maintain or enhance shore fishing access facilities. Information provided from research and monitoring programs is an essential component of effective management in all fisheries. Management of Victoria's larger bay and inlet fisheries is underpinned by targeted research projects and ongoing or periodic monitoring of fishing activities to provide information on fishery trends, the status of key target fish stocks, habitats and environmental conditions important for maintenance of fisheries resources, evaluation of the effectiveness of new or altered fishery management measures, community values associated with use of fish resources, and levels of satisfaction with existing fishery management arrangements. Apart from a long time series of commercial fishing catch records from 1914 to 2000, and some limited data on recreational fishing in the late 1980s and early 1990s, there is no systematically collected information on fisheries or fish habitats in the Anderson Inlet Fisheries Reserve. The most pressing needs are therefore to characterise the recreational fishery in Anderson Inlet; to establish programs in conjunction with recreational fishers to monitor fishery trends in the inlet and assess the status of the most important target species; and to identify habitat which is important for key target species in order to focus on priority fish habitat protection and maintenance requirements. Periodic surveys of representative samples of Anderson Inlet recreational fishers to provide information on the demographic profile of participants, on values associated with fishing in the inlet, and on levels of satisfaction with fishing opportunities. The most cost effective collection of such information is likely to be through periodic attitudinal surveys at fishing access points around the inlet (for visiting and local non-club fishers) and through direct survey of local fishing club members. Ongoing or periodic surveys of recreational fishing activities in Anderson Inlet to provide time series of information on preferred target species and to detect changes in catch and effort trends for key species. The most cost effective collection of such information is likely to be through creel surveys at access points around the inlet (for both visiting and local non-club fishers) and/or through establishment of angler diary programs in cooperation with members from local, and possibly some visiting, fishing clubs. Ongoing or periodic sampling of the size and age structure of the estuary perch population in Anderson Inlet and its tributaries to provide a time series of information on the relative abundance of successive year classes. Information is needed for pre-recruit fish (smaller than the legal minimum size) as well as recruited fish to provide a capacity to predict changes in fishery conditions and plan appropriate management responses. Options for collection of such information include sampling of estuary perch recreational catches during creel surveys, recruitment of avid estuary perch anglers to provide detailed information on both legal size and undersize perch via 'research' diaries, and fishery independent scientific surveys of perch in the inlet. Indicative current costs for the conduct of an access point survey in Anderson Inlet to obtain recreational fishing catch and effort and attitudinal information is $37,000 per annual survey. Indicative costs for the establishment and support of an angler diary program in the inlet are $16,000 per annum. Seasonal field sampling over one year to determine which habitats in the inlet (eg. seagrass/algae beds, unvegetated sand/mud areas, mangroves, Spartina-affected areas) are being used by or are important to various life history stages of the key target fish species - particularly juvenile estuary perch. Such a survey will also provide an assessment of the extent to which fish use or avoid Spartina habitat, and thus the consequences for fisheries resource production if Spartina continues to spread in the inlet. Indicative current costs for the department contribution to the conduct of this program is $20,000. This contribution is subject to the establishment of a partnership with the WGCMA as part of the RCIP. To date most of the funding for Victorian bay and inlet fishery monitoring and research has been provided from the Fisheries Victoria budget, with periodic contributions from the national Fisheries Research and Development Corporation. More recently, revenue derived from Recreational Fishing Licence fees provides an additional funding option - particularly for programs such as creel surveys and angler diaries where there is strong recreational fisher involvement. Funding opportunities for fish habitat assessment and protection projects may also be available through development of partnership arrangements with the WGCMA to seek funds through the RCIP. Unless exempt, anglers are required to hold a Recreational Fishing Licence (RFL) to fish the waters of the Anderson Inlet Fisheries Reserve. The requirement for an RFL applies to the taking or attempting to take, of any species of fish by any method. This licence also covers other activities such as bait collection, gathering shellfish, yabby fishing, prawning and spear fishing. Details of entitlements under this licence and other important information for anglers can be found in the Victorian Recreational Fishing Guide, which is released on an annual basis. There is a high level of community expectation that fishery resources will be maintained at sustainable levels and that the aquatic habitats that support them will be protected. The Act and the associated Regulations provide the legislative framework to assist in the protection of fishery resources. Successful fisheries management in Victoria, therefore, depends heavily on achieving optimal levels of compliance with this legislation. This is best achieved through a combination of maximising voluntary compliance and creating a deterrent effect. There is a growing level of awareness within the community that we can have a direct impact on the condition of fish resources through harvesting activities. For some species, specific management arrangements are in place and may include catch and size limits. It will become increasingly important to maintain a high level of angler compliance with legislation and to encourage behaviours consistent with the continued good health of the inlet. High levels of voluntary compliance require effective education and community awareness programs which promote and support close and ongoing cooperation between fishers and Fisheries Victoria, a high level of community awareness and understanding about management objectives and strategies and perhaps most importantly, a sense of shared responsibility for maintaining healthy fisheries for future generations. The department, through its Regional Fisheries staff, is responsible for the delivery of a range of services associated with fisheries compliance. A proportion of these services is funded directly from the Recreational Fishing Licence Trust Account. These services range from the provision of education and information services to the field operations of fisheries officers involving the detection of illegal fishing activities. For Anderson Inlet, these compliance services are delivered as part of the department's Gippsland Fisheries Program and Fisheries Victoria's Recreational Compliance Strategy. Fisheries staff providing these services are based at Yarram and Cowes. Fisheries Victoria recognises the need to maintain high standards of education and awareness programs relating to the Anderson Inlet Fisheries Reserve in keeping with the significance of the area as a fisheries reserve. Fisheries Victoria will continue to provide such services consistent with its Statewide education and awareness program. Fisheries Victoria's programs are often complimented by the community education activities of Fishcare Victoria. The aim of this Program is to foster responsible fishing practices and care for aquatic environments. This program has been active in promoting ethical fishing behaviour and respect for natural resources. The department's fisheries community education and awareness programs are complemented and supported by its efforts to ensure effective deterrents to potential offenders through its fisheries enforcement operations targeting substantial and deliberate breaches of the regulations. Land and water-based patrols by authorised fisheries officers provide important opportunities for communication and engagement with active fishers, as well as discouraging illegal activities by providing a physical presence. There are many compliance options available ranging from warnings through to prosecutions in a court of law. In the area of the Anderson Inlet Fisheries Reserve, these services are also funded and delivered through the department's Fisheries Program. The department operates a 24-hour Statewide offence reporting service. Users of the Anderson Inlet Fisheries Reserve and other waters who are concerned about suspected illegal activities are encouraged to report these matters on 13 FISH (133474). undertake targeted enforcement operations based on statewide priorities and resource risk to achieve fisheries objectives as defined in the AIFRMP. The AIFRMP describes arrangements for the management of recreational fishing in the recently established Anderson Inlet Fisheries Reserve. Initially, most fishery management measures in the Anderson Inlet Fisheries Reserve will remain unchanged while the focus is on establishing programs to characterise the recreational fishery; monitor fishery trends and the status of key target species; and identify key fish habitats in the inlet. If information from these programs indicates a need to alter fishery management arrangements in future to ensure sustainable use or to meet changing demands for recreational fishing opportunities, then changes will be considered in consultation with stakeholders. Any proposed changes to fisheries regulations may be subject to a Regulatory Impact Statement (RIS) process under the provisions of the Subordinate Legislation Act 1994, which requires extensive consultation with stakeholders. The AIFRMP will come into effect following a declaration by the Minister via a notice in the Government Gazette and will be made available to the public through the internet and as a published document. The Anderson Inlet Fisheries Reserve Reference Group will be established to work with the department to deliver the desired management outcomes from the AIFRMP. It is proposed that the Anderson Inlet Fisheries Reserve Reference Group include representatives nominated by VRFish, Fisheries Victoria, local government, Indigenous interests, WGCMA and Parks Victoria. The role of the group is to coordinate activities and projects in support of the AIFRMP actions, strategies and objectives. Ongoing implementation of the AIFRMP will require action by the department in conjunction with recreational fishers, VRFish and other stakeholders to establish the required fishery monitoring and research programs, to carry out day-to-day management activities, and to ensure compliance with fishery management arrangements. Key actions required to facilitate implementation of this plan are summarised in Table 2. An annual progress report on implementation of the AIFRMP will be prepared providing details of performance against key performance indicators. For further information on this management plan, comment on its implementation or recreational fishing in general, contact the department Customer Service Centre telephone 136 186. For further information on the activities of the VRFish, telephone (03) 9854 6167 or visit the VRFish web site at www.vrfish.com.au. Costs of establishing the required fishery monitoring and research programs, and potential funding sources, are described in Table 3 in the 'Research and Monitoring' section of the AIFRMP. Costs for regulatory amendment processes and implementation of fisheries compliance activities in the Anderson Inlet Fisheries Reserve will be met within the department's Fisheries Program budget allocation. AAV (Aboriginal Affairs Victoria) (2002). Aboriginal Coastal Shell Middens. Fact Sheet and Site Identification Mini Poster No. 13. Anon. (1981). The ecology of fishing in Botany Bay - biology of commercially and recreationally valuable species. Environment Control Study of Botany Bay No. 23B. NSW State Pollution Control Commission, Sydney. BCSC (2003). Inverloch Foreshore Reserve: St Kilda Street to Ayre Creek Foreshore Master Plan. Published by Bass Coast Shire Council, Wonthaggi. Blake, S., Roob, R. and Patterson, E. (2000). Seagrass mapping of Victoria's minor inlets. Marine and Freshwater Resources Institute, Queenscliff. Report No. 28. 52pp & appendices. Chapman, A., Dann, P., and Legge, D. (1987). Anderson's Inlet Waders and Waterbirds. Published by the South Gippsland Conservation Society, Inverloch. CSIRO (2000). Northern Pacific Seastar (Asterias amurensis). Marine Pest Information Sheet. CSIRO Centre for Research on Introduced Marine Pests, Hobart. DCNR (1994). 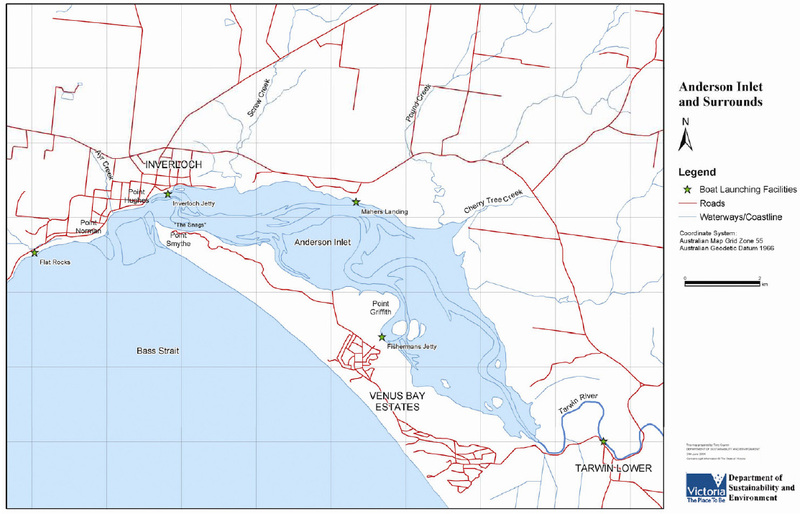 Inverloch Foreshore Reserve and Anderson Inlet: Proposed Management Plan. Victorian Department of Conservation and Natural Resources, Yarram Region. DNRE (1998). Inverloch Foreshore Reserve and Anderson Inlet Management Plan. Published by the Department of Natural resources and Environment, Victoria. DEDJTR (2003). Acid sulfate soil hazard maps - Guidelines for coastal Victoria. CLPR Research Report Number 12. 30pp. Fletcher, W.J., Chesson, J., Fisher, M., Sainsbury, K.J., Hundloe, T., Smith, A.D.M. and Whitworth, B. (2002). National ESD reporting framework for Australian Fisheries: The 'How To' guide for wild capture fisheries. Final Report for FRDC Project 2000/145. Fisheries Research and Development Corporation, Canberra. GCB (Gippsland Coastal Board) (2002a). Gippsland Boating Coastal Action Plan. Published by the Gippsland Coastal Board, Bairnsdale. GCB (2002b). Integrated Coastal Planning for Gippsland - Coastal Action Plan. Published by the Gippsland Coastal Board, Bairnsdale. Gomon, M.F., Glover, J.C.M. and Kuiter, R.H. (Eds.) (1994). The Fishes of Australia's South Coast. State Print, Adelaide. Harrison, I., Rogers, J., Smith, G. and Woodfull, J. (1990). Andersons Inlet: resources, issues and options for management. Master of Environmental Science Group Report. Graduate School of Environmental Science, Monash University, Clayton. Henry, G.W. and Lyle, J.M. (Eds.) (2003). The National Recreational and Indigenous Fishing Survey. Final Report on FRDC Project No. 99/158. 188pp. Published by NSW Fisheries, Cronulla. Hutchins, B. and Swainston, R. (1986). Sea Fishes of Southern Australia. Swainston Publishing, Perth. James, G.D. (1976). Eggs and larvae of the trevally, Caranx georgianus (Teleostei: Carangidae). N.Z. J. Mar. Freshwat. Res., 10: 301-310. James, G.D. (1978). Trevally and koheru - biology and fisheries. In. 'Proceedings of the Pelagic Fisheries Conference, July 1977'. M.A.F., Fisheries Research Division. Occasional Publication No. 15, pp 50-54. James, G.D. (1984). Trevally, Caranx georgianus Cuvier: age determination, population biology, and the fishery. New Zealand Ministry of Agriculture and Fisheries. Fisheries Research Bulletin No. 25. 51 pp. Jenkins, G.P. and May, H.M.A. (1994). Variation in settlement and larval duration of King George whiting, Sillaginodes punctata (Sillaginidae), in Swan Bay, Victoria, Australia. Bull. Mar. Sci. 54: 281-296. Jenkins, G.P., Black, K.P. and Hamer, P.A. (2000). Determination of spawning areas and larval advection pathways for King George whiting in southeastern Australia using otolith microstructure and hydrodynamic modelling. I. Victoria. Mar. Ecol. Prog. Ser. 199: 231-242. Jones, G.K., Hall, A., Hill, K.L. and Staniford, A.J. (1990). The South Australian marine scalefish fishery: stock assessment, economics and management. S.A. Dept. of Fisheries, Green Paper. 186 pp. Kailola, P.J., Williams, M.J., Stewart, P.C., Reichelt, R.E., McNee, A. and Grieve, C. (eds.) (1993). Australian Fisheries Resources. Bureau of Resource Sciences, DPIE, and the Fisheries Research and Development Corporation, Canberra. 422 pp. Last, P.R., Scott, E.O.G. and Talbot, F.H. (1983). Fishes of Tasmania. Tasmanian Fisheries Development Authority, Hobart. 563 pp. Lenanton, R.C.J. (1977). Aspects of the ecology of fish and commercial crustaceans of the Blackwood River estuary, Western Australia. Fisheries Research Bulletin, W.A., 19: 1-72. MacDonald, C.M. (1980). Population structure, biochemical adaptation and systematics in temperate marine fishes of the genera Arripis and Chrysophrys (Pisces: Perciformes). Unpublished PhD thesis, Australian National University, Canberra. 336 pp. MacDonald, C.M. (1983). Population, taxonomic and evolutionary studies on marine fishes of the genus Arripis (Perciformes: Arripidae). Bull. Mar. Sci., 33: 780. Massola, A. (1974). Notes on the Aborigines of the Wonthaggi District. Victorian Naturalist, 91: 45-50. McCarraher, D.B. (1986). Distribution and abundance of sport fish populations in selected Victorian estuaries, inlets, coastal streams and lakes. 2. Gippsland Region. Arthur Rylah Institute for Environmental Research, Technical Report Series No. 44. Published by the Department of Conservation, Forests and Lands, Heidelberg. McCarraher, D.B. and McKenzie, J.A. (1986). Observations on the distribution, growth, spawning and diet of estuary perch (Macquaria colonorum) in Victorian waters. Arthur Rylah Institute for Environmental Research, Technical Report Series No. 44. Published by the Department of Conservation, Forests and Lands, Heidelberg. McKay, R.J. (1992). FAO species catalogue. Vol. 14. Sillaginid fishes of the world. (Family Sillaginidae). An annotated and illustrated catalogue of the sillago, smelt or Indo-Pacific whiting species known to date. FAO Fisheries Synopsis. No. 125, Vol. 14. 87pp, 137 figs. Newman, S.J., Gaugan, D.J., Jackson, G., Mackie, M.C., Molony, B., St John, J. and Kailola, P. (Eds.) (2003). Towards sustainability of data-limited multi-sector fisheries. Australian Society for Fish Biology Workshop Proceedings, Bunbury, Western Australia 23-24 September 2001. Fisheries Occasional Publications No. 5, June 2003, Department of Fisheries, Perth, Western Australia. 186pp. Nicholson, G. and Gunthorpe, L. (Eds) (in press) Anderson Inlet Fish Habitats 2001. Compiled by the Fish Habitat Assessment Group. Fisheries Victoria Assessment Report No. 42. 38pp. (Primary Industries Research Victoria, Queenscliff). NREC (Natural Resources and Environment Committee), (1991). Report from a Parliamentary Inquiry into the Allocation of fish resources in Victorian bays and inlets. Government Printer, Melbourne. Parks Victoria (2003). Cape Liptrap Coastal Park Management Plan. 37pp. Published by Parks Victoria, Melbourne. Rash, J.A.E., Williamson, R.C. and Taylor, S.J. (1996). 'How green is your mudflat?' Proceedings of the Australasian Conference on Spartina Control. Held in Yarram, May 1995. Published by the Department of Conservation and Natural Resources, Yarram. Robertson, A.I. (1982). Population dynamics and feeding ecology of juvenile Australian salmon (Arripis trutta) in Western Port, Victoria. Aust. J. Mar. Freshw. Res., 33: 369-375. Smith, G.H. (1991). Competition for the use of fishery resources in Anderson Inlet: Balancing the exploitation of the aquatic living resources with the protection of the estuarine ecosystem. Unpublished thesis (M. Env. Sc. ), Dept. of Geography and Environmental Science, Monash University, Clayton. VCC (Victorian Coastal Council) (2002). Victorian Coastal Strategy. State of Victoria. Published by the Victorian Coastal Council, Melbourne. WGCMA (West Gippsland Catchment Management Authority) (2004a). West Gippsland Regional Catchment Strategy - September 2004. Published by the West Gippsland Catchment Management Authority, Traralgon. WGCMA, (2004b). River Health Strategy West Gippsland Catchment - Final Draft, March 2005. Published by the West Gippsland Catchment Management Authority, Traralgon. Williams, N.J. (1970) A comparison of the two species of the genus Percalates Ramsay and Ogilby (Percomorphi: Macquariidae), and their taxonomy. Chief Secretary's Department, NSW State Fisheries Research Bulletin No.11. Winstanley, R.H. (1985). Commercial fishery situation report: Tamboon Inlet. Fisheries & Wildlife Service, Victoria. Marine Fisheries Report No. 7. 27 pp. Excerpt from General Gazette G27, 3 July 2003, page 1725. The objective of this Order is to declare Anderson Inlet as a Fisheries Reserve and to specify its purpose. This Order is made under section 88 of the Fisheries Act 1995. This Order comes into operation on the day on which it is published in the Victoria Government Gazette. The area described in the Schedule is declared to be the Anderson Inlet Fisheries Reserve. establish a compliance strategy framework for the Reserve. 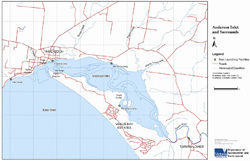 All that area of marine underwater terrain and superjacent water that is within an area consisting of the estuary and the Tarwin River below the Tarwin Lower Road Bridge (but not including the area of Cape Liptrap Coastal Park between high and low water mark). Excerpt from General Gazette G44, 30 October 2003, page 1725. The Anderson Inlet Fisheries Reserve Management Plan will identify key actions to protect habitats and enhance recreational fishing opportunities, including actions designed to improve the management and monitoring of recreational fishing and the impact of other issues (eg. habitat deterioration) on recreational fishing opportunities. The Anderson Inlet Fisheries Reserve Management Plan will specify appropriate management controls with regard to recreational fishing and may recommend options to assist in managing related activities. The Anderson Inlet Fisheries Reserve Management Plan will provide for the issue of permits by the Secretary in respect of activities in the fisheries reserve. The Anderson Inlet Fisheries Reserve Management Plan may specify areas available for any special use zones identified within the reserve. The Anderson Inlet Fisheries Reserve Management Plan will determine processes for reporting to the Victorian community on achievements of the plan. The Anderson Inlet Fisheries Reserve Management Plan will establish a compliance strategy framework. Provide advice to Fisheries Victoria in regard to achieving the stated objectives of the Fisheries Reserve during the preparation of the draft Plan. Fisheries Victoria will prepare the draft Plan. Consider public submissions relating to the draft Plan received during the period for the notice of intention to declare the Plan. Fisheries Victoria will collate the submissions and prepare a draft response to the steering committee. Provide advice to Fisheries Victoria in regard to preparing the final Plan. Fisheries Victoria will prepare the final Plan. Mr Rob Douthat Cultural Officer, Central Gippsland Aboriginal Health & Housing Cooperative Ltd.